TMNT IV: Turtles in Time is a SNES game that released back in 1992 but I didn’t play it until around 2000 when I was 5 years old and I would play this game with my aunt. We would always play this and when my brother got a bit older, I played it with him as well. This is a side-scrolling beat ’em up arcade game which was really good for its time. I always loved the arcade games when I was little. They were just really cool to me. I remember the duo, Bebop and Rocksteady in this game too and I loved them so much. I always thought they were cool and honestly, they still are. I found a commercial for Turtles in Time and I hope the nostalgia overflows you ’cause I know it did for me. 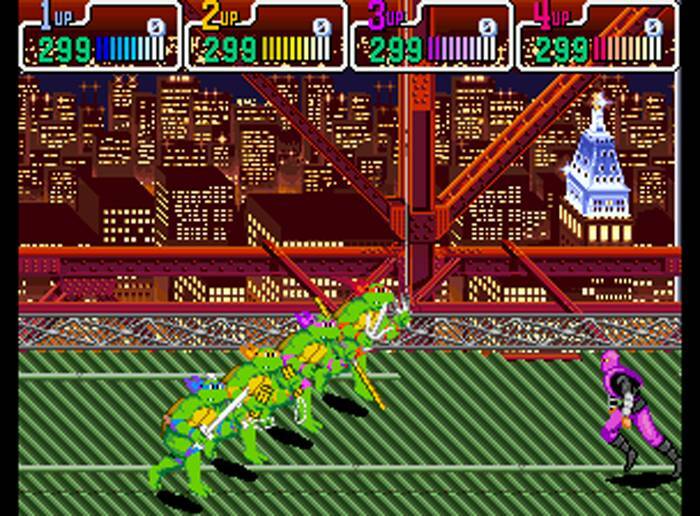 Have any of you played TMNT IV: Turtles in Time? I spend a LOT of quarters on this one. When I was younger and Chuck-E-Cheese was all the rage, by far the most popular hotspot in the whole arcade was the Turtles in Time arcade machine. It was pretty cheap and you basically got destroyed every couple of seconds, but it was a blast. I think one of my favorite parts from it was when you had to throw enemies at the screen where the boss was in his tank machine thing. Oh man that game rocked. Thanks for the callback!